It’s often called the backyard of Bakersfield and Kern County—the place where we escape for vacation, relax, explore, and dream. Paso Robles, and the beauty of the central coast, with it’s rolling hills, green vineyards and oak trees dotting the landscape—the place where one Bakersfield family is living out their dream of bringing Kern County and the rest of the world, award winning wine. Walk among the rows of Hope Family Vineyards—and you sense this is the place Austin Hope was destined for—a dream that happened upon the hope family—aptly named for the future that awaited them, and the struggles they would overcome to get there. We meet Austin Hope, at his vineyard and winery in Paso Robles, just west of highway 101 in the Templeton gap district, an area known for warm days, and cool nights. It’s harvest time here—a flurry of activity in the vineyard—as fruit picked from the vines is quickly moved into production—a weeks’ long process of fermentation, pressing grapes, and finally the moment when the juice is placed in oak barrels for years of aging. “I’ve always worked with the vineyard my whole life, was just obsessed with it,” Austin Hope said, as we toured his tasting room. To understand where his obsession began, you need to know more about his family’s ties to Kern County, and eventually their decision to uproot to the central coast. He was just 6-years old, when his father decided to move his family from Bakersfield to Paso Robles—Hope’s grandfather, W.A. Thompson, operating a highly successful beer distribution business dating back to the 1930’s. Thompson, owning the distribution rights to Coors, falstaff and colt 45 beer —controlling territory from Bakersfield to Barstow. ”He went from selling a few thousands cases of wine and beer a year, to selling 5-million cases of beer for the next 15-years of his life,” Hope recalled of his grandfathers expansive business. But 1977, his grandfather passed away, and the business sold. Austin’s Father, who worked as a truck driver for the family business, decided not to take over—and instead start his own journey planting apples, and growing grapes in Paso Robles. It was the Hope family’s decision to move to Paso Robles in the 1970’s that forever changed their family. The pioneers of this area, planting vineyards for the first time in this region, that decision paying off big, as years later they would begin a legacy in the wine business that spanned 40-years. That interest, turned into a widely distributed, internationally recognized wine brand—Which began when famed Napa valley winemaker, Chuck Wagner, whose responsible for Caymus, and Conundrum, considered the best wines of Napa, Wagner asked the Hope family to take over his label, Liberty School House. Austin Hope would study under Wagner for several years, and return to Paso Robles—ready to embark on his own journey of crafting the best cabernet in the area. “We wanted to create the standard for luxury cabernet for Paso Robles, that was the goal,” Hope said. Learn more about other wines under Hope Family Vineyard label Treana , Troublemaker , Liberty School, Quest. For the past 7-years, Austin Hope and his team has been perfecting this cabernet sauvignon —Seeking out the best soils, in the best sub-regions of the area to create a legacy wine—that accurately reflected the elegance of what central coast cabernet could be. ”We went to these areas, went to the growers, put leases in place, planning contracts in place,” Hope said. 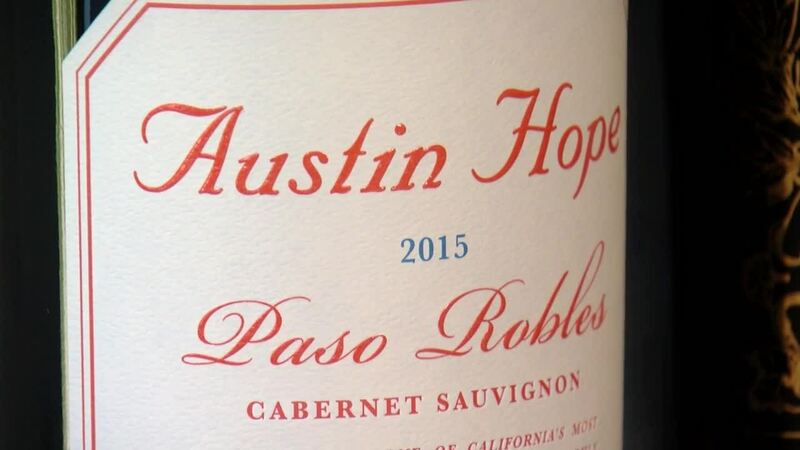 Austin Hope’s 2015 cabernet released last year, receiving a score from famed wine magazine, Wine Enthusiast—that is changing how the industry looks at Paso Robles. ”That publication has never given any wine, not just cabernet, in their publication, a higher score than 96 in Paso, so this is the first one they have ever done, and it’s extremity impactful, and very flattering and humbling,” Hope said of his accolades. The 2015, receiving a score of 97 points, near perfect according to wine scoring standards. The Hope family’s legacy from our backyard to the coast— their mission to create award wining wines from Paso Robles, that began right here in Kern County.